The Godwin Volney Dorsey House at 603 N. Wayne St., Piqua, is included in the Dec. 8 Holiday Home Tour. PIQUA — On Saturday, Dec. 8, the Piqua-Caldwell Historic District Association will be hosting their second annual Holiday Home Tour from 5-8 p.m. There are six historic homes featured this year and tourists will enjoy music along the walk and a vintage sip or nip at each home. One of the featured houses will be the Godwin Volney Dorsey House, located at 603 N. Wayne St., currently owned by Laura and Jeff Jackson. 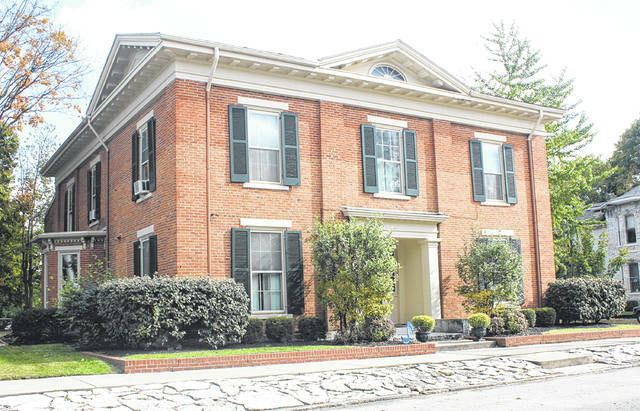 This Greek Revival home was built in 1850 by Dr. G.V. Dorsey. Dorsey’s medical practice was housed in the addition, which faces North Street and currently is rental apartment space. Dr. Dorsey was a prominent physician and surgeon in early Piqua and was an important contributor to political affairs during the Civil War years. He was also president of the Citizens Bank, and after Dr. Dorsey’s death in 1885, his son, Walker McCorkle Dorsey, lived there. His wife continued living there after his death until she died in the early 1950s, when the house was sold to Fritz and Betty Hemmert. When the Hemmerts purchased the home, they reapportioned the 25 rooms and made a second apartment plus the carriage apartment, both of which have their own private entrances on North Street. There was little change to the exterior of the home since Dr. Dorsey and his heirs occupied the house, but the interior was vastly improved. It took the Hemmerts seven years and 130 gallons of paint and paint remover to accomplish an interior renovation. Fritz owned Hemmert Plumbing, and Betty was a voice and piano teacher, organist at Saint Mary Catholic Church, and helped with local high school musicals. The couple had five children. Betty lived in the house until 2001, when she sold it to Laura and Jeff Jackson. Laura was a former piano student and longtime friend with Betty’s daughter, Julie. Tickets for the Holiday Home Tour are $25 apiece at Allisten Manor’s Flower Box, Mainstreet Piqua, and Readmore’s Hallmark in Piqua. Credit card transactions should be made at Mainstreet Piqua, 326 N. Main St.
Shelley and Chuck Black, co-chairs of marketing and advertising, recommend that tickets be purchased early since only 300 are available and last year’s tour sold out several weeks in advance. Proceeds from the tour will go toward signage identifying historic homes within the district. The association’s long-term goal is to place signs at the perimeter of the district to help accentuate the significance of these historic properties within the City of Piqua. For more information, contact the Piqua-Caldwell Historic District Association at P.O. Box 212, Piqua, OH, 45356.